TV is saturated with ads relating to the Athens Olympics at the moment. 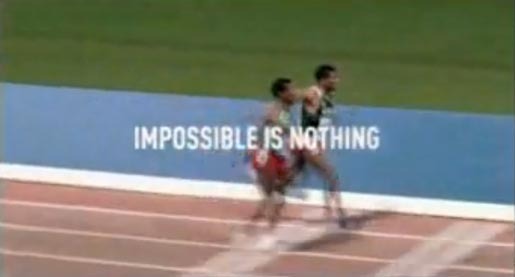 Adidas have a campaign around the theme, “Impossible is Nothing”. 180 Amsterdam have woven together a campaign using three spots with digital trickery matching present day athletes with previous champions. 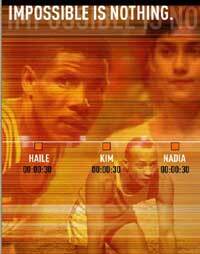 Ethiopian Haile Gebrselassie takes on the seemingly impossible challenge of beating himself. Nadia Comaneci ‘reappears’ in a choreographed routine on the uneven bars with 13 year old Russian Nastia Liukin. St. Kitts and Nevis world 100m champion Kim Collins plays the role of the latest sprinter who goes out there to attempt the impossible, running with the 1936 quadruple Gold medal winner Jesse Owens. There’s another collection of commercials on the Adidas site, referring to on-site advertising at the Olympics. The outdoor component of the campaign, conceived and produced by 180TBWA alliance partner TBWAChiatDay San Francisco, features a rich stable of past and present adidas athletes, such as Justine Henin-Hardenne, Ian Thorpe, Kim Collins, Maurice Greene, Haile Gebrselassie, Tim Duncan, Muhammad Ali, Jesse Owens, Pyrros Dimas (Greek Weightlifter), Ekaterini Thanou (Greek Sprinter). The site is powered by flash animation. Remember to allow site popups. The AThens campaign was developed at 180 Amsterdam (180\TBWA) by executive creative directors Peter McHugh (180 Amsterdam) and Lee Clow (TBWA Worldwide), creative director/copywriter Richard Bullock, associate creative director/art director Dean Maryon, account management partner Guy Hayward, account managers Nathan Plowman, Melina Polly, planner Josh Mandel, executive producer Peter Cline, agency producer Cedric Gairard and business affairs manager Chris Barrand. Filming was shot by director Lance Acord via Park Pictures, New York, executive producer Jackie Kelman Bisbee, line producer Deannie O’Neil. Editor was Eric Zumbrunnen at Spot Welders, Venice, with producer Heather Kojima. Special effects were produced at Digital Domain by FX supervisor Fred Raimondi, SFX producer Stephanie Gilgar. Sound was designed by Ren Klyce at Mit Out Sound, Sausalito, who also composed original music: “Stoic Piano” (Nadia), “Harmonium” (Jesse) and “African Piano” (Haile). The outdoor campaign was developed at TBWA, San Francisco, by executive creative director Chuck McBride, creative director Joe Kayser, art director Brandon Mugar, copywriter Aimee Lehto, account team Michael Allen, Mike Zlatoper, planner Elena Hale, print producer Justine Enoch, project manager Connie Dorman, studio artist Eszter Balazs, Elisabeth Parker, with photographers Uwe Duettmann, Kim Comeaux (USA), Sabine Bolzen (Europe), and Andy Anderson (IIN Olympics).